Long before the world became enraptured with Arnold Schwarzenegger or Sylvester Stallone, India had already received her share of a star bodybuilder who had the potential to become a legend in his own right. Some know him as the most celebrated but celibate god Hanuman in Ramanand Sagar’s Ramayan while some know him is the bubbly Geet’s strict grandfather from Jab We Met, but the role that catapulted him to stardom was in the film Jagga for which he received the Best Actor Award from the Government Of India presented to him by the then Prime Minister Indira Gandhi. Yes, he is none other than our very own Dara Singh. Born in a small village in the district of Amritsar in Punjab, Dara Singh went on to become a wrestler and later a fine actor in Indian cinema. Some of his noted films include Raaka, Mera Naam Joker,Watan Se Door, Dada, Sher Dil and Dharma Karam. And while Bollywood mourns his death and with it the end of the Golden Era of Indian cinema, it is pertinent that we remember him as the lively and charming personality that he was. 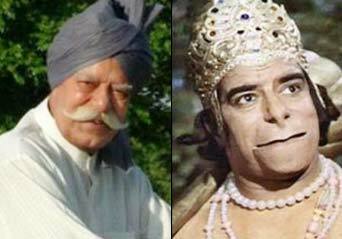 Dara Singh passed away on 12th of July 2012 after prolonged illness and is survived by his wife and children. For youngsters, Dara Singh was the epitome of a lovable and protective grandfather and that is how they learned to love him. But for those who had seen him evolve from a wrestler to an actor, his death is nothing short of a calamity. Last year saw the demise of some of the greatest names in Indian entertainment which includes Dev Anand, Jagjit Singh, Mansoor Ali Khan Pataudi and Shammi Kapoor and the demise of the great Dara Singh seems uncannily like a closure.